In Shaanxi Province there are essentially three remaining continues sections of The Great Wall of China that can be visited. The First of these sections runs from Yulin in the far north of Shaanxi Province where there is a Fortress and walled town, to the south-west and towards Jingbian. From Yulin Fortress the Wall heads westward to section ends at some distance north-east of of Jingbian and it does not reach the Town. To the South-West of Jingbian however, the Great Wall of China continues with a second section. This is the section that runs slowly North-Westward towards Dingbian. The Third Section runs from Dingbian Town westward into the Ordos Desert, then turns upward to reach Yinchuan the Capital of Ningxia Autonomous Region across Shaanxi's Western Border. Together these sections were constructed to guard the lush green lands of Shaanxi Province to the South-East and the vulnerable Yellow River Valley and Silk Road crossing-point Lanzhou to the South-West. 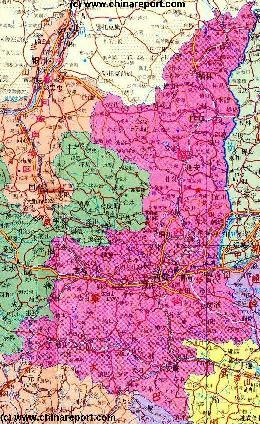 A Geographic overview Map of Shaanxi Province entire delineating provincial borders and parts of neighboring Gansu and NingXia Provinces in the West, Inner Mongolia Autonomous Region in the North, Shanxi and Henan Provinces to the East and Hubei, ChongQing and Sichuan Provinces in the South. This Map Includes Cities and Towns (shown by size), Main Monuments & landmarks of Shaanxi Province, the flow of the yellow river along the borders with Shaanxi- and Shanxi-Provinces, Great Wall of China locations in North Shaanxi Province, Main Mountains (with Height), major highways, provincial railroads and main railroad-stations and main waterways & rivers. This Map further provides links to on site photos and information on the City and Area of Xi'An, nearby Lintung Village. Other scenic or historical sites will be included in the Future. Today Yulin and its Great Wall of China remain a remote and few visited Great Wall of China, especially no foreigners are found here. Zhen Bei Tai (Pacify the North) Tower, an observation platform from where one has a grand view of the desert beyond the pass. said to be the largest Platform overlooking the Great Wall of China. Zhenbeitai Beacon Tower lies nearby the Fortress on Mount Hongshan. It is a four-storied square tower, 30 meters high, measuring 320 meters around its base. The four stories decrease in size towards the top and between each storey there is a staircase to enable the soldiers to ascend to the top. There was a watch shed at the top of the tower from where the soldiers could receive and send signals but this collapsed during the Qing period. In the immediate area of Town there are a further two fortified gates remaining of two small Fortresses outside of town, these are Chang Le Castle and Jie An Castle. Elsewhere only ruins of Great Wall remain, or stumps of Beacon Towers. A nearby (1km) attraction are the Red Rock Gorges where one can dwell among and marvel at the traditional underground (Cave) housing in historic use in this region. The caves keep cool in summers, but remain warm in winter and are easy to construct among the many hillsides of the Loess plateaux. Hongshixia (Red Stone Gorge) is Located in the north of Yulin and apart from its Cave Dwellings it is famous for many ancient Chinese calligraphic works carving on the cliffs. The Town of Yulin (also known as Tuocheng) is a Prefectural City who's administrative area consists of one county-level administrative district, and 11 counties. The City itself counts just over a 100.000 citizens. The County-level district is Yuyang District and the Counties are in succession Qingjian, Suide, Shenmu, Jia County, Fugu, Zizhou, Jingbian, Hengshan, Mizhi, Wubu, and Dingbian. The section of Great Wall leading West from Yulin ends at Dingbian. Since 2003 AD and the advance of new highways Yulin is rapidly modernizing along with the rest of China. Because of its remoteness located off main trade and travel routes through The Peoples Republic of China however, have preserved it well. That is, the City Walls are largely intact, and the old historic Bell Tower stands proudly among busier and busier traffic on the streets. The city walls of Yulin are among the three best and most well preserved in Shaanxi. Although common through the region in the Past, today preserved City Walls surround Yulin, Yan'an - the Communist Headquarters in the 1930's- and Weinan Cities. The Yulin City Wall has been damaged during its long history. A combination of natural disasters and human destruction has helped to undo the brick layering of original walls leaving bare the core made of rammed earth. The combined total length of the city walls in Shaanxi Province measures more than 1,056 miles. Most of the walls were built in Wei, Qin, Sui, and Ming Dynasties. They are composed of city walls, terraces, barracks, beacon towers and watch posts. Hongjiannao Lake is also located north of Yulin. This Lake is the largest inner land fresh lake of Shaanxi Province and is honored by the local folk as 'Shining Pearl in (the) Sand Sea'. At some distance travel of Yulin Town lie Yima City, Kuangong City. The list of local historic monuments is includes Li Zicheng's Temporary Palace. Clinging to a high hill, it was established under the order of Li Zicheng a famed farmer rebellion leader who set up a kingdom in the Ming Dynasty (1368 AD-1644 AD). Next in the list is Tongwan City Site: Tongwan City was the capital city of Daxia Kingdom, which was established by a leader of the Huns in the Eastern Jin Dynasty and a Last is a Revolutionary Site, is the Yangjiagou Site in Mizhi County, which combines with Shenquanbu Revolutionary Memorial Hall in Jiaxian County. The most recent news on Yulin is that the Town will receive a Great Wall of China Museum and that several hostels and hotels will be constructed in order to fully develop the Yulin Great Wall Site for (Mass) Tourism. So far Zhenbeitai Great Wall Hostel, Zhenbeitai Culture Park and Yulin Great Wall Landscape Park and Great Wall Recreation Park have been developed in a total planned area of 6 km2 to be built in three stages. The second stage should finish by 2010 AD and the Third and last in 2015 AD. Shaanxi and located between the contiguous areas of Loess Plateaux and the grasslands in Inner Mongolia Autonomous Region. 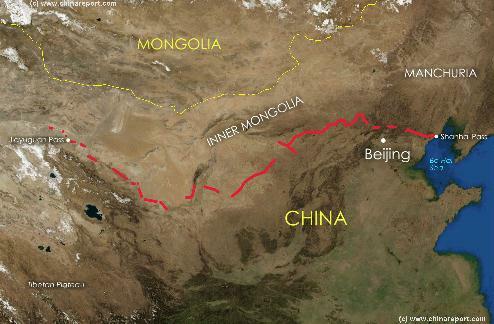 The climate is rather arid and summers hot, hence no less than 18 sandstorms a year (on average) batter the sections of the Great Wall of China in this vicinity. As early as the Paleolithic and Neolithic Ages, human beings already lived in Yulin area. The earliest proof of human civilization in the area were relics of the Yangshao and Longshan Cultures dating back to 6,000 years ago found along the two banks of the Wuding River. According to historical records, Yulin and nearby sandy area's were a farming and pastoral area in Han dynasty; at the time it was described as “a vast fertile farmland with high production and lush pastures with flocks of sheep and goats”. Known earliest under the name Shangjun, Yulin then became part of Qin State in the Warring States Period (476 BC to 221 BC), and subsequently became one of the 36 shires of the Qin Dynasty (221 BC-206 BC). During the Eastern Jin Dynasty (317 AD -420 AD), a king of the Huns established Daxia Kingdom and set capital in Tongwan City (Tongwan Cheng - today's Jingbian County of Yulin Prefecture). In the Tang Dynasty (618 AD -907 AD), Yulin area - at that time blessed with a beautiful landscape with limpid streams, was divided into three states, which were then combined into two new ones Yulin and Suide. Throughout the ages, central China and the nomadic tribes ceaselessly fought for possession Yulin and region, an area of important strategic significance. During the long era's of strife, bot sides - but mainly the Han, built their defensive works. Thus, the remnants of the Great Wall around Yulin originate from no less than six historic periods. Meanwhile, under Wars, over-population and human intervention with the many streams in the region, the local climate turned increasingly arid. The 8Th Century saw the initial formation of the Maowusu Desert. Desertification of Yulin Region is attributed to the long-time exceedingly quartered husbandry starting from the 4th year of the Zhenguan to the years of Tianbao in the Tang Dynasty (618 AD - 907 AD), which resulted in the destruction of the ecology of the natural grassland, brought soil erosion and ushered in the sandstorms that still rage frequently today. By the 9Th Century in the Tang Dynasty disasters overwhelmed those clinging on to farming in the area. According to sources of the Era sand was piled up to the city wall of Tongwancheng City in 822 AD making life unbearable. North-Shaanxi remained sandy, arid and full of Sand dunes with sand and alkaline shoals making up 70-80% of available land throughout the Yuan and Ming Dynasty. During the Ming Dynasty Era (1368 AD - 1644 AD) Yulin Town was reinforced into a Walled City with a Garrison (Zhen) after which it was used as a station and patrol base in support of the Great Wall's massive defenses along the Northern Borders. The Yansui Zhen, the garrison of Yulin Town was responsible for the 880-kilometer (550 Miles) section between Fugu near Qingshuiying (Qingshui, Inner Mongolia AR) to the East at the Yellow River and Huamachi (today's Yanchi, Ningxia) on the border with Ningxia Hui Autonomous Region to the west. By 1403 AD the Yulin Garrison Town had become a fortified citadel but only in 1407 AD the Yansui Zhen or garrison was moved into the Town. After 1407 AD and the moving of the Garrison into Yulin it gained even greater importance in the defensive networks. As a consequence more fortifications were built, extending the Wall to the City. In this way one section of the Great Wall also served as one of the Yulin City Walls. At the Time the city was enclosed within a rectangle with five gates. In due Time large numbers of soldiers were introduced as the Ming Rulers militarized the border with Mongolia. During the Reign of Ming Emperor Xiaozong (Reign 1488 - 1505 AD) the Great Wall of China in the section between present day Anbian Town of Shanxi Province to cut across North Shaanxi Province and Yulin Garrison Town to the east bank of the Yellow River in Wulin County of Ningxia Hui Autonomous Region was ordered rebuilt. Even more defenses, watchtowers and beacons were constructed throughout Shaanxi and Eastern Ningxia Hui AR. The most famous Beacon Tower at Yulin, Zhenbeitai Tower was constructed in 1607 AD during the Wanli Reign of the Ming Dynasty, some 200 years after the establishment of the Yulin Garrison. Wherever a garrison is established the civilian population will expand to support it. This was true of Yulin and the city soon became an important trading post with the Mongol Tribes to the north. Markets were established and a thriving Yulin served both as a military base and trading centre in this northern part of Shaanxi throughout the Ming Era (1368 AD - 1644 AD). Much later, in the civil war of the 1930's and during the War against the Japanese Invasion from 1937 AD to 1945 AD, Yulin was an indispensable stronghold in the so called Shaanxi, Gansu and Ningxia Revolutionary Base and China's famed Revolutionaries such as Mao Zedong, Zhou Enlai, Peng Dehuai, Liu Zhidan and Xie Zichang, have worked and fought in and around Yulin. In this era Yulin was especially remote and poor. In 1949 AD, Yulin state was liberated under the lead of China's Communist Party. In 2000 AD, Yulin was promoted from county level city to prefecture-level city. A Full Google Earth Supported Map of Yulin & Great Wall by Google.com. 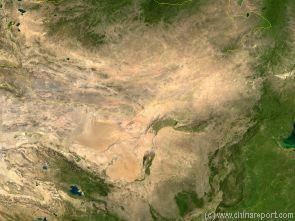 Adjacent Map gives direct access to the Yulin Map by Google Earth.